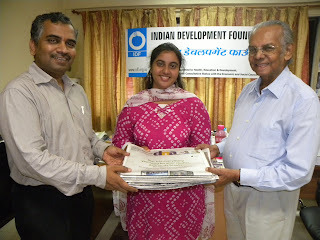 Indian Development Foundation (IDF) Conducted Health Awareness (AV) programme Insight Academy, Bangalore. IDF have conducted 8 programmes in all the classes of the school.The children were very co operative & attentive and asked some questions and doubts. The interactive session conducted by Mr.Arulraj went on very well. Principal guided students on the necessity of such information and also asked the students to disseminate the information with in the society. Dr. ARK. Pillai and Dr. Narayan B. Iyer addressed the students of SBOA School & Jr. College, Anna Nagar and the students of NSN Matriculation School, Chitlapakkam, Chennai on 27th Aug. 2013. Team Indian Development Foundation (IDF) spoke on the "Role of students in developing the nation & their involvement in social responsibility projects" and "Leadership in Action" . The message on leadership skills and Social Responsibility was well received by the young minds and many students came forward to lend a helping hand for the national development projects. Mr. D.Thomas Franco Rajendra Dev, Correspondent and Mrs. P. C. Selvarani, Principal (SBOA School) and Mrs. Chithra Prasad, Principal (NSN Matriculation School) appreciated the work of IDF. Mr. S. Sreeram, Manager, IDF along with Mr. John Anbalagan, Headmistress of the school and Mr. Sathyamurthy co-ordinated the special assembly. IDF Salutes Schoolteam for their benevolence. Indian Development Foundation (IDF) Project Co ordinator Mr. P. Sanjay Ram greets former president Dr. A. P. J. Abdul Kalam. Dr. Kalam was presented flowers and painting from the children. He was very happy to receive the gifts from children. Mr. appreciates Dr. Kalam, "A true leader, inspirational talk, igniting minds of young children. Dr Kalam is a true igniter of minds and he has already done that by seeding love for India in hearts of many Indians. It may not possible for many of Indians to achieve heights in life like him. However, by following his message of love; we all can transform this nation into a heaven on earth. SMALL STEPS FOR A CAUSE... MATTERS A LOT. 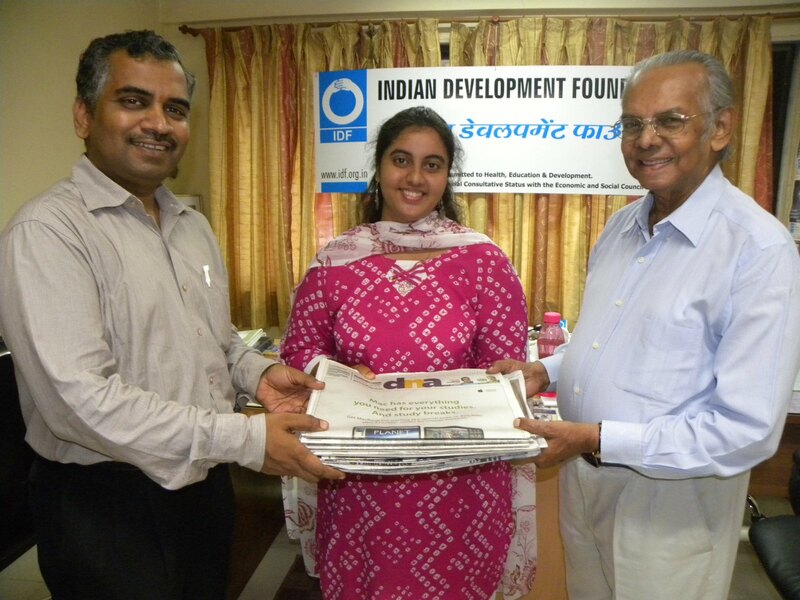 Indian Development Foundation (IDF) Mission W2K (Waste to Knowledge) to support IDF Bal Gurukuls is one of the best project to bring smiles on many lives, expressed IDF Social Ambassador Memon Salma as she presented the contributions received by selling 250 kgs of old newspapers. Many friends have volunteered to donate their monthly old newspapers and support the noble task, said Salma. Dr. ARK Pillai and Dr. Narayan Iyer appreciated the wonderful social initiative of Salma and congratulated her promoting social causes. Indian Development Foundation conducted Health Awareness Programme (HAP) at A.V.K. Nursing college, near Monotype bus stand, Banasankari, Bangalore, Karnataka. Students in good number participated in the awareness programme. 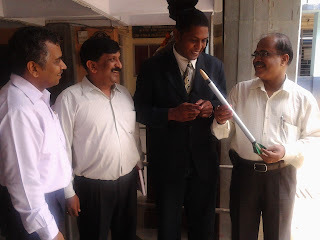 Dr.T.Prabhu B.sc, M.B.B.S, M.D, FICP was the chief guest and Dr. Seetha was the speaker. Dr. Seetha conducted power point presentation about " TB " to the students. IDF is thankful to Mr. Shenoy from KSTBA and Mr. Logesh from RED CROSS for their continued contribution towards the awareness programme. “Learn with fun” is the only motto for live coach trainer Mr. Mahendra Ingle who heads the Career Seed Coaching. Where SEED stands for ‘Shine by exploring to Empower Destiny’ and made it a memorable event by coaching the 9th grade students of Vivek Vidyalaya in Goregaon (W) and Sarvodaya Balika Vidyalaya in Malad (W) on Thursday, 22nd August 2013. Mr. Ingle casually told them to play passing the pass with a ball. Previously he let them play and later referred it as their career and then students played with it more cautiously without letting it fall. In a testament to just know if students really learnt anything he asked “what if the ball falls?” A girl replied, “Sir if it falls I will make sure that I will be strong enough to get up and play carefully henceforth”. He added “any information or incident can be stored in brain with deep intensity or pain remains permanent”. As an example we won’t remember what we did two days ago but no one will forget the attacks of 26/11 as that truly had an impact. So does knowledge on the same lines when learnt with intensity remains permanent he concluded”. The Programme was being organized by Indian DevelopmentFoundation in association with the Vivek Alumni Association. 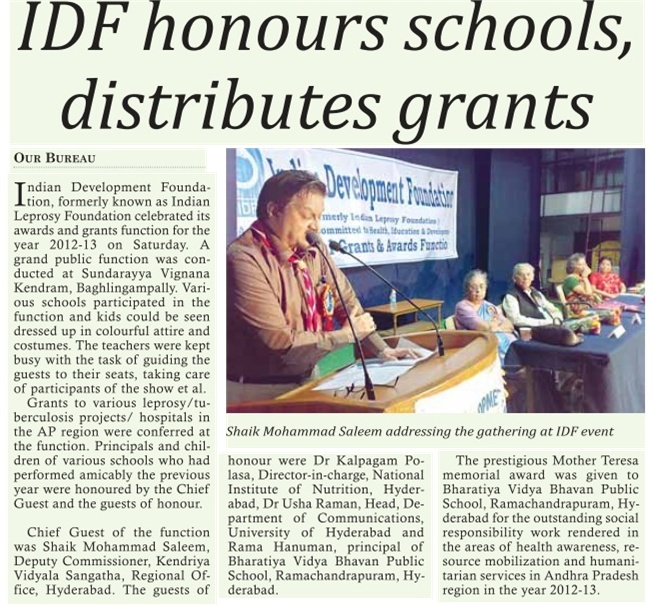 IDF thanks Dr. Suresh Nair, Principal Vivek Vidylaya and Mrs. Lata Venkataraman, Principal Sarvodaya Balika Vidyalaya for their continued support. IDF will conduct series of such programme for many more schools. Indian Development Foundation (IDF) conducted Health Awareness Prog. (HAP) at Bharat Mat.Hr.Sec School at Krishnagiri Dist. The Prog was attended by about 1300 students with all teachers, HM, principal & with secretary & correspondent Mr.Mani. The students were very attentive throughout the session. The students also asked queries through the session; the session was very interactive. Secretary thanked IDF for conducting the programme. IDF appreciates the efforts of the school. Considering the paucity of health care resources, the NGOs and members of the public should come in large measure to supplement and support Govt. Initiatives observed Mr. Shaik Mohammad Saleem in Hyderabad. He said that the initiatives of Indian Development Foundation in the fields of health, education and development were critical and suggested that initiatives in these areas should be encouraged in good measure by the Government. 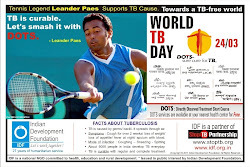 Expressing his concern over the increase in the number of drug resistant TB patients in India, he called for concerted efforts in spearheading T.B. awareness all over the country. IDF has earmarked Grants totaling Rs.10 Million to 310 health/ education projects all over India during the year. IDF Grants Release Function is an annual feature of to share its resources with leprosy/ TB projects and promote self-reliance. Mr. Shaik Mohammad Saleem, Dy. 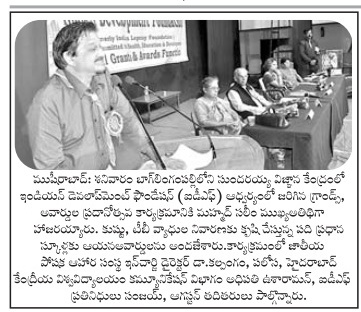 Commissioner, Kendriya Vidyalaya Sangathan was speaking as the Chief Guest at IDF Grants/ Awards Function at Sundarayya Vignana Kendram, Bagh Lingampally, Hyderabad on 17th August 2013. He gave away IDF Grants to leprosy/ TB hospitals and projects in Andhra Pradesh regions. Mr. Saleem also presented Awards to 16 Principals of Schools in Andhra Pradesh with star Performance record of leprosy/ TB awareness programmes and resource mobilization and awarded Medals and certificates to 103 students for their signal contribution. Prestigious Mother Teresa Memorial Award 2012-13 was presented to Bharatiya Vidya Bhavan Public School, Ramachandrapuram, Hyderabad for outstanding resource mobilization for leprosy/ TB work in Andhra Pradesh zone. Mrs. Padma, Teacher of the School received the award on behalf of the school. SOCIAL ACTION AWARDS 2012-13 were presented to Principals and Teachers while IDF Ambassador Award were presented to volunteers for their excellent Social Responsibility. IDF Best Partner Awards were presented to Sivananda Rahabilitation Home, Kukatpally – Secunderabad Public School, West Marredpally and Kendriya Vidyalaya No.2, Uppal for excellent support extended for leprosy/ TB and environment awareness programmes. Dr. A. R. K. Pillai, founder President, Indian Development Foundation who presided over the function said the government and voluntary agencies worked hand in hand with admirable co-operation to achieve the leprosy elimination status in India and hoped that marvellous results could be managed with planned private public partnership. Dr. Pillai shared that around eight million children still did not have access to education and conveyed the resolve of Indian Development Foundation in opening a large number of Bal Gurukuls across India. Dr. Pillai thanked the public for their understanding and continued support. Sharing resources and serving others give greater joy and this will be the gospel for the future, Dr. Pillai added. Dr. Kalpagam Polasa, Director In-charge, National Institute of Nutrition, Hyderabad, expressed her concern over the increasing prevalence of obesity and type II diabetes among children. He said people should adapt to a sensible life style. Appreciating IDF for spearheading awareness on leprosy and Tuberculosis, she emphasised that awareness on diabetes and cancer was also a need of the hour. Dr. Usha Raman, Head, Dept. Of Communications, University of Hyderabad was Guests of Honour at the function. She said the participation of young students in social service was quite encouraging and giving a positive hope for future. Bharatiya Vidya Bhavan Public School, Township, BHEL, Ramachandrapuram, Hyderabad topped the list in resource mobilisation for leprosy/ TB while the second and third places went to Bhavan’s Sri Ramakrishna Vidyalaya, Sainikpuri, Hyderabad and Secunderabad Public School, West Marredpally, Secunderabad respectively in Andhra Pradesh Region. Sai Lalith Reddy G and Sai Chandra S.K., from Secunderabad Public School, bagged the first and the third prize in the individual students list in resource mobilisation while second prize went to Pritesh Deb. from Bhartiya Vidya Bhavan Vidyashram, Rajendranagar, Hyderabad. People from all walks of life attended the well-organised function. Earlier Mr. Sanjay Ram, Project Coordinator of the Foundation welcomed and introduced the guests, while Mrs. P. Rama, IDF Social Ambassador proposed a vote of thanks. Dr. Narayan B. Iyer, CEO - IDF compered at the function while Dr. S. Franklin, CE – IDF, co-ordinated the event. Students of Kendriya Vidyalaya No.2, Uppal, Hyderabad set the tone for the event with a soulful invocation. Students from Secunderabad Public School, West Marredpally, Hyderabad had put a skit on TB awareness. Shiloh Jessie Francisca Student of Rani Seethai Achi School, Chidambaram has been a constant supporter of IDF from 3rd standard. She has been regularly contributing to the IDF activities in every possible means. IDF appreciates Shiloh for her constant support. Indian Development Foundation (IDF) launched its 130th Bal Gurukul - Jeevanjyot Bal Gurukul at Unit 22, Aarey Colony, Goregaon (East), Mumbai on 10th August 2013. The project will run in collaboration with Maharashtra Lokahita Seva Mandal (MLSM) and St. Vincent Palloti Church. 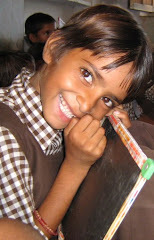 Ms. Shakila would be assisting students with their Academics in the Bal Gurukul. We are very much thankful to Father Charles and Father Francis for their presence in the event and guiding and enlightening the students. MLSM and team has done a wonderful job by organizing the entire function. Thanks to Ruby madam, Shilanand Sir and the entire MLSM team. Thanks to Mr.Shashank Shetty, Mr. Ashwin M Kothari and Mr. Kennady Kaisar for gracing the event and motivating the young minds. IDF News in Doordarshan, Podhugai - 07-08-2013. India’s progress in leprosy eradication efforts has been spectacular and the participatory work by governmental and voluntary agencies is laudable, observed Mr. B. S. Raghavan in Chennai on Wednesday. We are happy that the cherished dream of the Father of our nation for leprosy elimination has come true. It is time to focus on T.B. 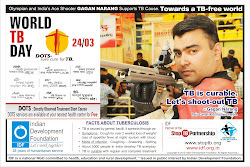 awareness as India is the world capital of T.B. Community participation is the key to better health, Mr. Raghavan added. Mr. B. S. Raghavan, Former Policy Advisor to UN was speaking as the Chief Guest at IDF Grants/ Awards Function at Bharatiya Vidya Bhavan, Mylapore, Chennai on 7th August 2013. He gave away IDF Grants to leprosy/ TB hospitals and projects in Tamil Nadu and Kerala regions. IDF has earmarked Grants totaling Rs.10 Million to 310 health/ education projects all over India during the year. 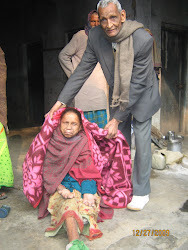 IDF Grants Release Function is an annual feature of Indian Development Foundation to share its resources with leprosy/ TB projects and promote self-reliance. Mr. Raghavan also presented Awards to 83 Principals of Schools in Tamil Nadu and Pondicherry with star Performance record of leprosy/ TB awareness programmes and resource mobilisation and awarded Medals and certificates to 409 students for their signal contribution. 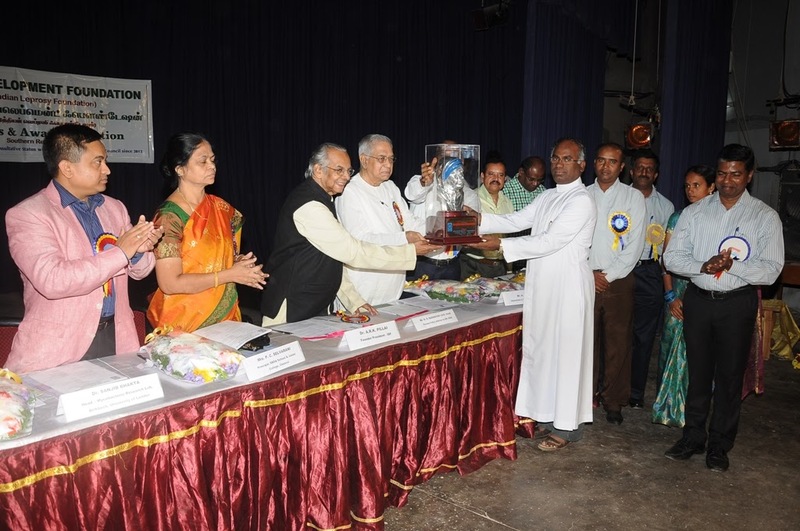 Prestigious Mother Teresa Memorial Award 2012-13 was presented to Montfort School, Trichy for outstanding social work and support extended for leprosy/ TB work in Tamil Nadu zone. Rev. Bro. Dhanraj, Principal of the School received the award on behalf of the school. Dr. A. R. K. Pillai, founder President, Indian Development Foundation who presided over the function said the government and voluntary agencies worked hand in hand with admirable co-operation to achieve the leprosy elimination status in India. Dr.Pillai thanked the public for their understanding and continued support. Sharing resources and serving others give greater joy and this will be the gospel for the future, Dr. Pillai added. Dr. Sanjib Bhakta, Head - Mycobacteria Research Lab, Birkbeck, University of London - Mr. E. Mariappan, Director (NEWS), Doordarshan - Mrs. P. C. Selvarani, Principal, SBOA School & Jr. College, Chennai – Mr. J. Ravichandran, CEO, German Leprosy & TB Relief Association and Mr. A. Asokan,Industrialist were Guests of Honour at the function. They complimented Indian Development Foundation’s role in India’s fight against leprosy/TB and for widening its activities to include health care, education and development. Montfort School, Trichy topped the list of schools in social work while the second and third places went to St. Joseph's Convent Hr. Sec. School, Nagercoil and Jayarani Girls Hr. Sec. School, Nethimedu, Salem respectively in Tamil Nadu Region. F.A. Shiloh Jessie Francisca from Rani Seethai Achi Hr. Sec. School, Chidambaram topped the individual students list social responsibility while second and third ranks went to Pristine S. from Metro Matric Hr. Sec. School, Mettupalayam and Chriset Jeyaraj from Montfort School, Trichy respectively. People from all walks of life attended the well-organised function. Earlier Dr. S. Franklin, Chief Executive of the Foundation welcomed and introduced the guests, while Mrs. Siva Kamakshi, IDF Social Ambassador proposed a vote of thanks. Mrs. R. Rajammal, IDF Social Ambassador compered at the function. Students of Kendriya Vidyalaya No.2, Tambaram, Chennai set the tone for the event with a soulful invocation. CLICK WEB ALBUM FOR ALL PICTURES. Indian Development Foundation team visited Rani Seethai Achi Hr. Sec. School, Chidambaram, Cuddalore District, Tamil Nadu on 5th of August 2013 and expressed gratitude and appreciation for their constant support extended to the cause of leprosy/ TB and education projects of IDF for several years. Dr. ARK Pillai, Dr. Narayan Iyer and Mr. S Sreeram thanked Mr. R. Dharbaranyan, Headmaster of the School and all the students for their constant support. The team also appreciated Ms. Shiloh Jessie Franscisca, IDF Social Ambassador's efforts in sponsoring children in IDF Bal Gurukuls for a decade. 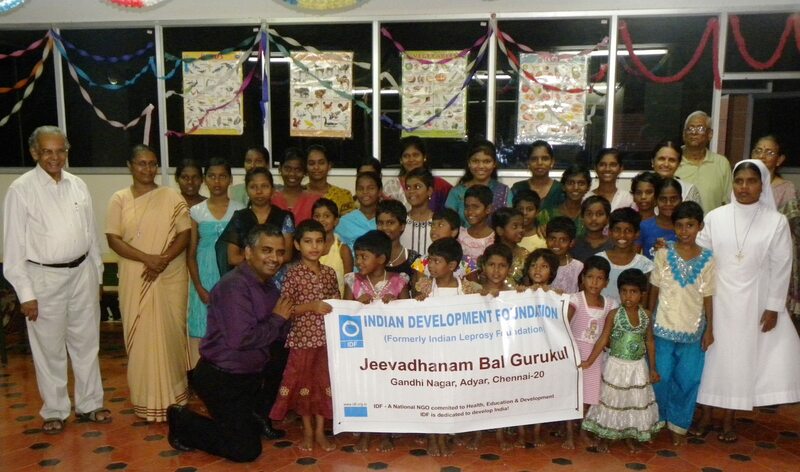 Indian Development Foundation (IDF) launched its 126th Bal Gurukul - JEEVADHANAM BAL GURUKUL at Adayar, Chennai on 05-08-2013. Our appreciation to Rev. Sr. Stella and Rev. 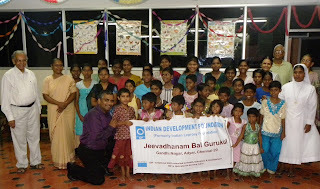 Sr. Sandhya for their wonderful support to the girl child education. Thanks to Mr.S.VishwanathanJi, Mrs. Kamala Vishwanathan and Mrs. Vijayalakshmi for their participation.